JAKARTA, Indonesia - The family of a Canadian teacher accused of sexually abusing three young students at an international school in Indonesia says his trial continued today with testimony from an alleged victim. Neil Bantleman's brother says in an email to The Canadian Press that the hearing lasted more than six hours, with an alleged child victim referred to as "DA" giving testimony via teleconference for more than two hours. 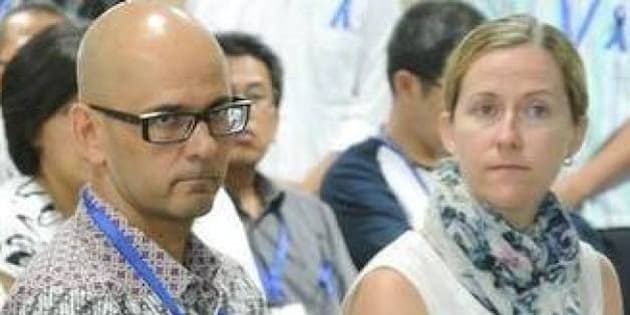 Bantleman, who is from Burlington, Ont., was arrested in July along with an Indonesian teaching assistant, and both are accused of sexually abusing three students at the Jakarta International School. Both men have maintained their innocence and the school's principal and a number of fellow teachers also say the two are innocent. The teacher's brother Guy Bantleman says more than 100 parents, students and school staff came to the South Jakarta Court for today's session, but that officials from the Canadian and British embassies were denied access to the courtroom. He says that according to defence lawyers and the defendants, the child's testimony today was "inconsistent and illogical" and that during the session, the child was reported to be seen looking to his mother — who sat beside him holding his hand — for confirmation of his responses. He also says the child's father — referred to as "OA" — testified in court, adding the father was "confrontational" and was repeatedly admonished by the judges for not following the rules of the court and not answering questions directly with a yes or no response. Bantleman's family has noted that Bantleman and the assistant Ferdinand Tjiong were only arrested after the parents of one of the alleged child victims failed in their efforts to reach a financial settlement with the school over alleged abuse by school janitors who were also accused in the case. The janitors have been sentenced to up to eight years in prison following their separate but related trial. Their lawyers have called their verdicts unfair and have vowed to appeal. Both Bantleman and Tjiong could face up to 15 years in prison if convicted. Their trial is expected to last three months, a time during which Bantleman's family is urging Ottawa to publicly declare its support for the Ontario man.